Many Mac users choose to put their computers to sleep when they’re not in use, and unless Macs are scheduled to wake at a specific time, the computer should stay asleep until it has been manually awoken by user input, like a key press or mouse click. Should of course is the operative word here, because some users have discovered that their Macs are waking from sleep seemingly at random, with no obvious reason for this to happen. If you run into such an issue, the first thing you should is try to figure out why the Mac is waking up from sleep to begin with. This can be done by looking at system logs for wake reasons and matching them to their appropriate codes, but sometimes the reason isn’t entirely obvious, or the “wake” reason isn’t defined beyond simply saying ‘User’ or ‘USB’. In these situations, there is often a less obvious cause for the random system waking events: Bluetooth. It turns out that if a Mac has Bluetooth enabled, by default it allows Bluetooth devices that have been paired with the computer to wake the Mac from sleep. That’s because things like the Apple Wireless Keyboard, Magic Trackpad, and Magic Mouse, all are wireless bluetooth devices, and users usually like the ability for their mouse or keyboard to wake the Mac from sleep. And this is where the problem sometimes lies, as a key or button may be inadvertently pressed or clicked to cause the wake action (like a cat walking across the keyboard), and in some less common situations, unrelated Bluetooth activity may wake the Mac too. 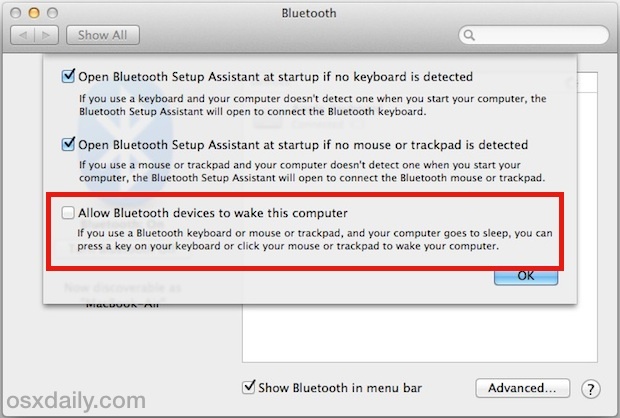 If you suspect this is the cause of the random wake activity, you can stop this behavior by disabling the ability for paired Bluetooth devices to wake a Mac from sleep. Keep in mind that doing so will cause the user to have to wake the computer through other means – like using a tethered USB connection, hitting the power button on a Mac, using WOL with an iPhone or Android, or something similar. That’s all you need to do settings wise, so give it day or few to see if this resolves the problem. Remember, this will disable the ability for an intentional key press on a Bluetooth keyboard, trackpad, or mouse to wake the Mac as well, which may make it impractical for many users. While you shouldn’t need to disable this feature, users who are are encountering a consistently randomized wake behavior should give this a try, it has been reported to solve the issue when nothing else is an obvious cause. Pretty much had this exact thing happening to me a while back: would put Mac to sleep at night, find it woken up in the morning. And, guess what it was? My cat walking across the wireless keyboard, perhaps to the surprise no cat owner! Mischievous little critters apparently fond of the Mac platform, don’t recall him doing that on my PC! My mysterious wake problem was a hacker. I don’t think enough users are educated on how almost all mac apps are open to hackers. and how to secure them. All computers are likely be hacked. Secure and encrypt, from beginning to end. Tape over your camera. Pedophiles can be hackers, too. A stalkers delight. Then enjoy the heck out of it! This setting doesn’t help. I am using Macbook 2015 El capitan. I have to completely disable bluetooth.